Remember the amazing veil of secrecy that surrounded the identity of "Hero Ace Red" and "Lead Hero Combatant Blue"? Here's our review of "Hero Battler Red"! Armed with razor sharp claws and super speed, Black Panther pounces into the fight. The Black Panther costume, in the comics, is basically just a black bodysuit. Even in the '90s, when armor was all the rage, all he got were a few golden accents. 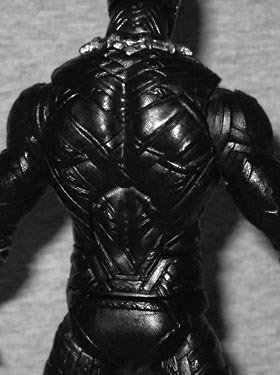 The Black Panther costume, in the movie, has panel lines that clearly suggest it's made of something other than simple cloth. The lines have a sort of "tribal" influence, which usually means "Pacific Islander" but this time is supposed to make him look generically "African." Wakanda kind of wanders all over the continent - it's bordered the Atlantic Ocean, been landlocked in the southern half of the continent, nestled just outside the Horn... it gets around. So for once, treating Africa like a single, culturally homogenous country kind of works in the story's favor. The point is, BP's sculpted with overlapping geometric details that give him some visual flair and make him look like he belongs with the other movie characters. Black Panther isn't actually black - he's more of a dark dark grey. The accent details are done in silver, rather than gold, but the shapes are similar to the comics: angled belt, "tooth" necklace, sharp claws, etc. Even his ears get outlined in it! Some of the concept art gave him yellow eyes, but the final product made them white. When asked about award ceremonies snubbing black actors, Chadwick Boseman said he'd "rather have an action figure than a Golden Globe." Well, good news, he's got one! 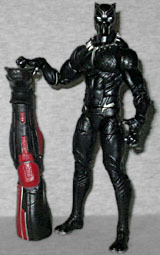 The figure includes an alternate, unmasked head, showing T'Challa in all his bare-faced glory. The likeness isn't great - he looks a bit like John Boyega - but it's a game effort. One of my absolute favorite bits in Civil War was a minor piece of sound design. Pay attention whenever T'Challa is fighting in costume: while the other characters are jumping around and landing with audible thumps, Black Panther hits the ground almost silently. It's brilliant. Brilliant! His costume is lined with Vibranium, so of course he wouldn't make any sound when he moves! The figure has enough articulation to get him into pretty much any battle pose you'd want: balljointed head, hinged neck, swivel/hinge shoulders, swivel biceps, double-hinged elbows, swivel/hinge wrists, a hinged torso that actually has a deep range of motion, swivel waist, balljointed hips, swivel thighs, double-hinged knees, and swivel/hinge rocker ankles. He does have the tight hips that a lot of Marvel Legends have had recently, but his hands are posed with the claws bared. Action! 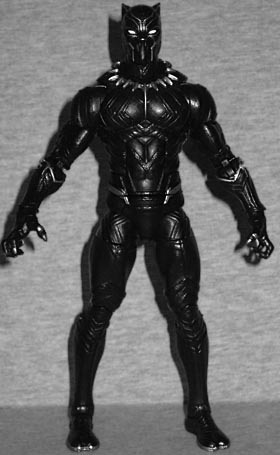 Black Panther has no accessories, just the last piece needed to build Giant-Man. His bit of the BAF is the left leg, so sweet sassy molassey, the big guy will finally be able to stand up! It's taken long enough. The Civil War toys still haven't reached saturation. They made their first rare appearances in stores shortly after the movie opened, and here we are three months later still waiting for anything other than blind luck to deliver them to our hands. I found Black Panther (and the rest of the series) in Toys Я Us on a Saturday, and by Tuesday they were all gone again. 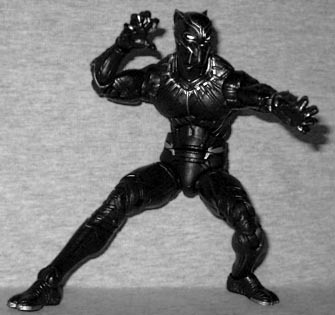 Black Panther is a good toy, so if you see one, maybe don't hesitate to pick it up.